Several decades of research of the interrelationships between diabetes and periodontitis have evolved into a significant body of knowledge that should be incorporated into dental practice. However, there may be a delay in implementing this important information into everyday patient care. 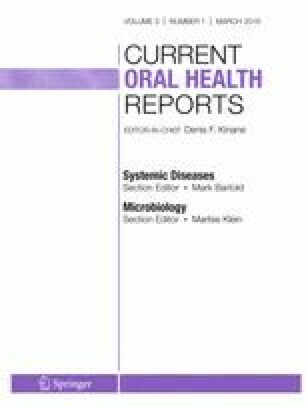 Oral healthcare providers (i.e., dentists and dental hygienists) should be progressively engaged in changing the trajectory of the epidemics of diabetes and periodontitis. This article synthesizes the cumulative evidence on the diabetes-periodontitis link, proposes ideas for risk stratification of dental patients with diabetes and periodontitis, and builds a case for the development of a risk-prediction model that provides for the earliest identification of dental patients who have dysglycemia. Casey Hein declares that she has no conflict of interest. International Diabetes Federation. IDF Diabetes Atlas Sixth Edition Poster Update 2014. Available at: http://www.idf.org/sites/default/files/Atlas-poster-2014_EN.pdf. Accessed 18 Sept 2015.